The VWR digital heat block is a great choice for uniform heating with digital control. 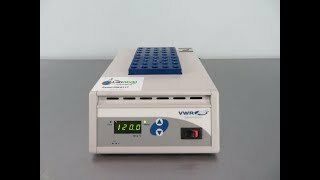 This dry heat block works great for immunoassays, incubation, cell and tissue cultures. Each aluminum block keeps constant, uniform, temperature in a compact easily moved footprint. The digital controls of this incubator are easy to access in the front of the system. Interchangeable heat blocks are designed to handle different configurations such as PCR strips, test tubes, vials and micro plates. The temperature range on these low profile Dry Block heater are ambient to 150°C. This VWR digital heat block has been thoroughly inspected and is in great condition. All of our lab equipment comes backed with our standard warranty. Should you have any questions, please don't hesitate to contact us.